Acrylic Cover - Display the beauty of your photographs inside and out. Your image is printed directly on the Acrylic. Cover available with Standard, Distressed, Pearlescent and Textured leather. Printed Metal Cover - Present your image on our hand-cut, metal cover. The Printed Metal Cover is truly a one of-a-kind look. Cover available with Standard, Distressed, Pearlescent and Textured leather. Custom Image Cover - Customize the cover of your Miller’s Signature Album with one of your very own images. The design will be printed on one of four substrates and will wrap around the entire cover of your album. 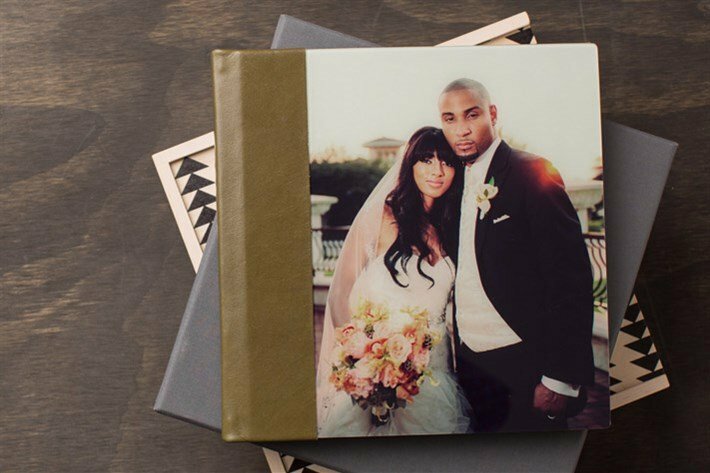 If selecting canvas, your image is printed on canvas substrate and a coat of lamination is added for protection. Glossy covers are printed on E-Surface photographic paper with a coat of high gloss lamination applied. Our Fuji Pearl option is printed on Fuji Pearl photographic paper with high gloss. Satin Covers are made of E-Surface photographic paper with a coat of matte lamination on top. Standard Leather - Our standard line is made of genuine Italian full grain leather. These moisture resistant leathers age beautifully with a rich patina.